FOUNTAIN VALLEY , Calif. , Feb. 15, 2010 – For the mid-2010 model year, the Elantra has been upgraded with an optional in-dash LG Electronics navigation unit. This system features Bluetooth and mapping software for the continental United States and has available POIs (Points of Interest) for entertainment, shopping and dining. Route guidance is provided by audio and 2D map prompts. The easy-to-use unit is controlled via 6.5-inch high resolution touchscreen that is significantly larger than the ones found in Nissan Sentra and Mazda3. The Elantra GLS with Navigation Package is only $17,995, making it the least expensive full-screen-navigation-equipped vehicle among comparable models. The system features 8GB of internal flash memory for the map data and comes matched with a 200-watt AM/FM/XM Satellite Radio/CD/MP3 audio system with internal amplifier. It can also access phone numbers employing a Bluetooth hands-free phone book and allows driver and passenger to access their personal listening devices through the iPod® /USB inputs . The FM/XM Satellite Radio interface is also integrated into the navigation unit and features song/artist/title information. XM Satellite Radio is complimentary for the first 90 days. 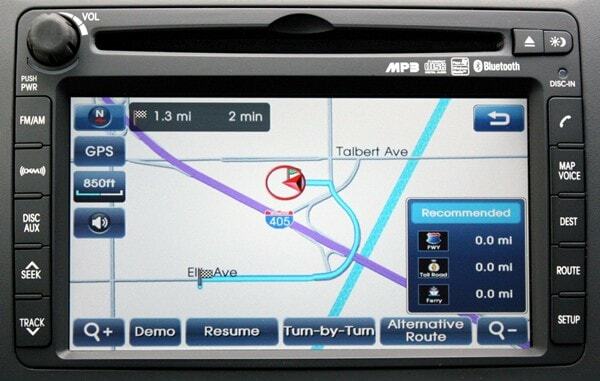 The touchscreen navigation-equipped Elantras arrive in dealerships this month. The award-winning Elantra enters 2010 an improved weapon against gas prices, with the all-new Blue model achieving a highway fuel economy rating of 35 miles per gallon. Smart engineering enhancements to the rest of the 2010 Elantra lineup improve fuel efficiency by up to four percent. These new fuel economy numbers give Elantra an advantage in price-per-MPG ratio, making it an even stronger value for 2010. In addition to all these enhancements, Hyundai Elantra earned the J.D. Power and Associates award for the highest initial quality in the compact car segment. Base MSRP w/o Freight Hwy. To make the Elantra “Blue,” engineers added a “smart” alternator management system, lower friction engine components, revised transmission gear ratios, engine calibration changes and a shift indicator to last year’s Elantra GLS manual. This new high mileage Elantra is indentified with unique “Blue” badging. From the Blue edition, the rest of the Elantra line receives its lower friction engine components, “smart” alternator management system and an improved lock-up torque converter to maximize fuel economy at highway speeds. GLS 25 → 26 33 → 34 4 percent in city, 3 percent on hwy. SE 25 → 26 33 → 34 4 percent in city, 3 percent on hwy. Elantra also returns this year with the convenience of Hyundai’s iPod® /USB auxiliary inputs, a new “waterfall” grille, rear chrome trim, chrome interior accents and a monotone black interior color choice for SE models. Music lovers will welcome the 2010 Elantra’s inclusion of XM Satellite Radio and standard auxiliary input jacks (3.5 mm mini-jack and USB input) to accommodate and charge audio devices such as iPods. When an iPod or flash drive is connected through the USB port, not only does it play music through the vehicle’s six-speaker audio system, but it also charges the iPod. The audio display included with this system also allows both driver and passengers to easily view song/artist/title information and control the music from the audio head unit rather than from the iPod itself. Still standard on the Elantra SE, Electronic Stability Control (ESC) is the industry’s most significant new safety technology since the seatbelt. ESC compares the driver’s intended course with the vehicle’s actual response, then brakes individual front or rear wheels and/or reduces engine power as needed in certain driving circumstances to help correct understeer or oversteer. According to Insurance Institute for Highway Safety (IIHS) research, if all vehicles were equipped with ESC, as many as 10,000 of the 34,000 fatal passenger vehicle crashes that occur each year could be prevented. In addition, the Elantra has also received a five-star frontal and four-star side crash rating in the compact passenger car segment from the National Highway Traffic Safety Administration (NHTSA), and earned a “Good” rating in the IIHS’s frontal offset test, the Institute’s highest rating. Finally, the addition of a standard Tire Pressure Monitoring System, which alerts drivers if tires are under inflated through an illuminated readout on the dash, rounds out Elantra’s safety features to make it one of the smartest purchases in the compact class. For more information on the 2010 Elantra visit www.hyundainews.com . Hyundai Motor America, headquartered in Fountain Valley, Calif., is a subsidiary of Hyundai Motor Co. of Korea. Hyundai vehicles are distributed throughout the United States by Hyundai Motor America and are sold and serviced through almost 800 dealerships nationwide. All Hyundai vehicles sold in the U.S. are covered by the Hyundai Assurance program which now includes the 5-year/60,000-mile fully transferable bumper-to-bumper warranty, Hyundai’s 10-year/100,000-mile powertrain warranty and 5-year complimentary Roadside Assistance in addition to the highly acclaimed vehicle return policy introduced in early 2009. For more details on Hyundai Assurance, please visit www.HyundaiAssurance.com .